This post is about that rare health care professional who leaves an impact, who just blows you away. But not in a good way. So here’s my story. The first time that I ever felt defeated it was not because of the demands of the illness, it was because I was face to face with the most idiotic doctor that I have ever met. At 14 months my daughter had her second operation; to place a PEG feeding tube. 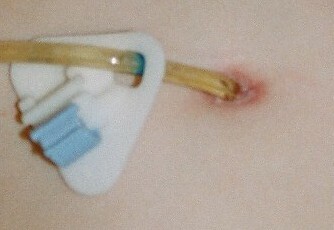 A hole is cut through the stomach to the outside and tube is inserted and held in place (by the plastic triangle you see in the picture). The operation went well and a week later they removed the plaster that was placed underneath the white triangle (I only know what it is called in dutch, plaatje). It all looked good, no infection so we went home. At home I noticed that her clothes kept on getting wet. At first I thought she had spilled something on herself but two clothes-changes later I realised that she was leaking. It was like a magic trick: her clothes were dry, she drank from her bottle and abracadabra, her T-shirt was wet. I did all the checks: triangle in place, not too loose; clamp was closed; no holes. The PEG was ok but she was leaking directly from her stomach! It is bad enough that her kidneys are leaky but now everything she drank just came straight out again in seconds! How could we stop her dying from dehydration if nothing stayed in? I know that this cartoon and these words don’t really go together but this illustrates what was happening (and I use humour to deal with almost everything). I took her to hospital and she was admitted. It was the weekend so we had to wait hours for the gastro specialist to come. (A piece of advice – if you are going to get sick and go to the hospital, don’t do it at the weekend. It’s like a ghost town). Finally the gastro doctor came to see what this obviously crazy mother (me) was getting her knickers in a twist about. I explained. She looked at me like I was a moron and told me “they always leak a little bit in the beginning. It’s normal. The hole needs to close a bit and that takes a week or so”. She wouldn’t listen to me; that is was a flood, not a drip. 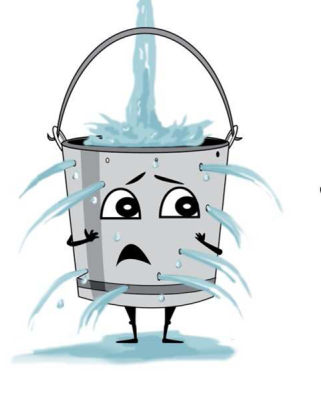 She didn’t listen to my explanation about Bartters; that my daughters condition means life threatening dehydration and she can’t afford to “leak” for a week or so. She patronised me some more and I cried. I had no words. I had been dismissed as if I was a panicky, neurotic mother who jumped at her own shadow. We had survived 14 months of various calamities such as septicemia, frighteningly high fevers, gastritis, weeks in intensive care, non stop vomiting and I had stayed positive and pragmatic. Now I felt helpless. I knew that we were going to lose her. Not because of the illness but because of arrogance and stupidity. I was not going to let this happen! I called the nurse and asked her to watch. My daughter was sitting up and I gave her a drink. The nurses eyes widened and her eyebrows shot up as my daughters clothes became drenched. She looked at me with apology in her eyes and dashed off. Investigations were done. It turns out that they had cut the hole too big. We came up with a plan: gauzes, regulate the rate of fluid with the feeding pump, only little sips for my thirsty baby. It got resolved. It often does. But we need to be more than parents, more than carers. We need to be crusaders, ready to withstand the lashes of disdain and condescension meted out by that special group of arrogant doctors who believe that just because we are parents, we know nothing. It only takes one doctor like that to crush your spirit. Most of the doctors at our hospital are great (please don’t ever develop your career and move on, stay here for us!) and my daughter was alright in the end. But I will never forget the day when that doctor almost killed my baby because she was too arrogant to listen and too stupid to see. So to all you good doctors and nurses out there I want to say thank you for listening. We parents sometimes get in the way, ask a lot of questions, insist that you really do just check that again. It’s our job. Thank you for knowing that part of your job is to let us be heard. We are a major part of the care team. Categories: bartter syndrome, care giver burn out, carer, chronic illness, parent | Tags: Conditions and Diseases, Dehydration, doctor patient relationship, doctors, Feeding tube, Mental Health, Motivational Quotes, patient care team | Permalink. It is so true! A little bit of condescension can crush your spirit and push you over the edge. I am a critical care nurse as well as a mom of a little girl with Gitelman’s Syndrome and dilated cardiomyopathy. It DRIVES ME CRAZY when providers won’t listen to me because I am “the crazy mom.” Even without my nursing knowledge, I deserve to be listened to. we do deserve to be listened to! i’m just so glad that they are not all like this. We are a major part of the health team: nurses and doctors must include parental knowledge to get a full sense. We’ve had similar struggles with gtube related issues. After two years, we finally discovered her tube was placed wrong (penetrated into colon). we may not be doctors but we know when something is wrong. Keep advocating so fiercely for your daughter! Oh gosh that’s awful! So glad it got resolved. And a nurse will save the day. Oh I have met so many great nurses!. Occasionally there is a dragon amongst them but a many are great. Just as long as someone listens! I cannot even imagine a baby going through this. I had a jpeg tube about 4 years ago because I have gastroparesis and get malnourished and dehydrated a lot and at that time I was told I had to have it to save my life. They took me off to surgery, implanted the peg tube and it damn near killed me. The next day it was leaking everywhere, I spiked a fever of 103, had staph, cellulitis, and abcess. My 3 or 4 day hospital stay turned into 18 days. The pain was unbearable, the worst I’ve ever felt and I’ve given birth 4 times. On day 14, they finally decided it was safe to take me back to surgery, remove the jpeg tube, open me up to remove the abcess, close me back up and implant a jejunostomy tube on the other side of my abdomen. I had it for 9 months. It hurt all the time and was infected all the time. I am so sorry that your baby has to go through this, it’s awful. Oh wow, you really had a tough time with your tube. Hope you don’t have to go through that again. The peg site has been a cause of pain for her for a long time. We have tried all sorts: sterile gauzes, zinc salve/nappy cream, frequent changes to the dressing and they did help. Now we have some bamboo cotton peg patches that are just perfect. Really help with absorbing the stomach acid that leaks and helps against granulation in the wound. She hasn’t had pain from the peg site since we started using these. That thing just hurt me the whole time. It was very painful. I’m glad you’ve found some things that work and she’s no longer having that pain. 🙂 Did I not respond to your email? I hadn’t heard back from you on that, but maybe I just read it and didn’t have the time or energy to respond. I’ll go back and check my emails. I believe we were going to skype about something, is that correct? You’ll have to excuse me, I’m very forgetful. Sorry about that, but I’m a natural blonde LOL, I’ve got fibro fog, medication fog, ADHD, and everything else. We got over a foot of snow last night, and I love snow, so I am a happy camper. Hope you’re having a good day, my friend and I’ll be talking to you soon. I think you did what I often do. I think about the reply and then somewhere in my brain I then believe I have actually replied. Take your time with the email and reply when you can. Take care and we will talk when you are out if the fog. I can tell you 90% of the doctors I’ve seen (including specialists) for my son’s condition were as arrogant and stupid as the one you had to endure. From the dismal of a serious allergic reaction to penicillin, to the callous doctor who was adamant my son was not allergic to anything (5 minutes before he tested positive to everything) and she decided to no longer treat him – her 5 prong approach became a zero prong approach. To the nurses that laughed at us changing his diet, to the doctor that said our son was well fed, rather than a bloated stomach, not 5 minutes before I showed him his weight chart, the results of which he decided to admit him to hospital. To the doctor that virtually shouted at us, after our son had an adverse reaction to medication, to the doctor who refused to let us try complementary therapy – and virtually said ‘oh no, you’re one of THOSE patients’ – the list goes on and on and on. 10 years later our son is still sick. I’m sorry to hear that you and your son have had such a tough time. How awful. It’s amazing how you keep going in the face of such adversity. Do you mind if I ask what he has? Hi, thanks for your suggestion but I will pass. Sometimes it does take a lot of time to write these posts but that’s the point: writing. I love writing and the things I write are personal, hopefully thoughtful and above all, real. I’ll keep writing my own posts.